Project obstacles and solutions: An earthen levy was constructed around the town of Markle, IN in the 1950's to protect the city from flooding from the Wabash River. Prior to this, flooding had threatened to destroy the entire town. This levy, along with the construction of the Edward Roush Dam and Reservoir, was a part of an Army Corps of Engineers project to control flooding along the Wabash River. Over the years, the river's current had eroded the banks of the earthen levy and it was beginning to fail. 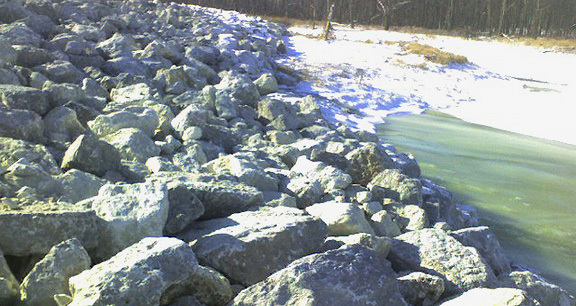 In 2010, the Army Corps of Engineers hired the Roc-Key Construction Company from Taylorsville, KY to build an alternate rock levy to protect the original levy from further erosion. The rock levy would serve two purposes. First, it would work as a breakwater barrier from fast moving currents and stop the erosion of the banks. It would also serve as a permeable vane dike that would allow some water to permeate slowly through the rock barrier, while diverting the majority of the water to the main channel and away from the toe of the earthen levy. The Louisville District Engineer and Geologist for the Corps chose IMI to supply the stone for the project. Both the IMI Huntington and Bluffton quarries were sourced for limestone that achieved superior quality ratings in resisting freeze/thaw material breakdowns and overall material strength. The project was constructed with 4,000 tons of INDOT revetment rip rap as the core of the rock levy. Along with this, 6,000 tons of INDOT 36” class 2 rip rap was placed on the levy with excavators to protect the core from the currents of the river. The levy was completed in a record time of one month. The Army Corps of Engineers was very pleased with both the speed and quality of the project.